Ready and willing to take your weedy iPad around the back of the bike sheds to give it a good duffing up are Panasonic’s new mean Toughbook Android tablets, the 10-inch A1 and the 7-inch B1. The 10-inch A1 packs a 1.2Ghz Marvell dual-core processor, backed by 1GB of RAM, 16GB of internal storage and an open MicroSD card slot, all housed in a super-robust package. Whereas most tablets will shatter into a zillion pieces when dropped, the macho Toughpad A1 will laugh in the face of a 4-foot drop. It can also handle temperatures running from 14 and 122 degrees Fahrenheit, and offers some resistance to water and dirt. Battery life is rated at 10 hours, with the battery being user-replaceable. Available with LTE or WiMAX connectivity options, the tough-guy tablet can also be customised for remote access and encryption, with the whole caboodle weighing in at a hefty 2.13 pounds. The A1 has been priced for a business-oriented crowd at an estimated street price of €850 + VAT for the standard model and €999 + VAT for the 3G model,and we’ve got no info at all on the smaller 7″ model as yet. Secaucus, NJ, November 7, 2011 – Panasonic, an industry leader in rugged, reliable handheld and tablet computers since 1996, today unveiled the Toughpad™ family of professional-grade Android™-powered tablets (#Toughpad), which includes a 10” and 7” device. The devices—targeting mission-critical and highly mobile workers—will be supported by an eco-system that includes an enterprise focused app store, peripherals, developer tools, deployment support and more. The 10” Toughpad A1, available first, is ideal for highly mobile outdoor workers in markets like aviation, construction, field sales and the public sector, where exposure to extreme environments is a constant challenge and the consequence of a failure is significant. The device can also be used as a tool to optimize business processes as a cost effective pen / paper replacement. The 7” Toughpad B1 targets similar markets, but in applications where screen real estate is not as critical and where device mobility and portability are critical. Panasonic has created a purpose-built line of Android-powered tablets, designed with enhanced security, long product life, and advanced device management in mind. The Panasonic Toughpad family will allow government and commercial enterprises, as well as SMBs, to realize the true potential of tablet computing without sacrificing security and while delivering a high return on investment. Enterprise-class mobile computing requires an enhanced level of device security that is not available in today’s tablet market. To address this need, the new Toughpad family is designed with security in mind. The Toughpad A1 incorporates security embedded at the hardware level and offer technologies like hardware and software encryption, enhanced VPN, dual factor authentication, trusted boot and device management. This enhanced level of device security means the Toughpad A1 will be compliant with FIPS 140-2 for Federal government use and HIPAA ready for healthcare environments. The Toughpad™ family can be managed with a custom set of low level controls that provide IT Administrators with unprecedented power over their Android-powered devices. This level of mobile device management (MDM) is essential for successfully deploying and managing Android-powered tablets in the field. These controls allow IT managers to distribute applications in a one-to-many environment, secure devices from unauthorized use and many other granular features not found in consumer-grade Android-powered tablets. Besides having access to the existing selection of Android Market™ applications, the Toughpad is supported by the Business AppPortal™, an enterprise-focused app store offering best-of-breed vertical market specific solutions as well as applications addressing broad enterprise concerns, including Mobile Device Management, security and virtualization. This highly secure, cloud-based user storefront allows IT Managers and developers to store, download and test applications for use on their Toughpad devices. Panasonic will also offer private application stores within the Business AppPortal, which businesses can customize to meet their specific needs. The Toughpad A1 has a high brightness, 10.1” XGA capacitive, multi-touch, daylight-viewable screen so mobile workers, in markets like supply chain logistics, utilities and the military, can easily see critical data and operate the device regardless of lighting conditions. The Toughpad A1 offers a stylus and active digitizer, enabling flexible data entry in the field, as well as signature capture and handwriting recognition functionalities—ideal for sales, customer service and mobile point-of-service environments. Other features include integrated cameras, a serviceable battery, multiple options for peripheral connectivity and battery life that will accommodate a full day of work. 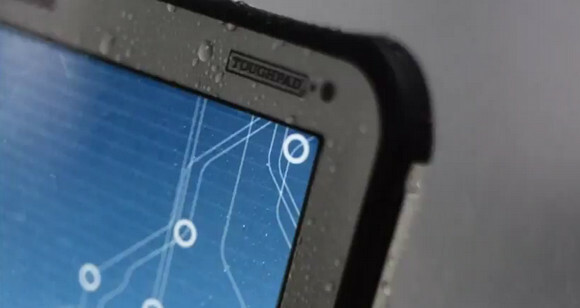 The new Toughpad family is designed to meet many of the same durability standards as Panasonic’s Toughbook PC product line. The devices have MIL-STD-810G ratings for drops as well as ingress protection ratings for resistance to dust and water. The Toughpad A1 is also rated for use in a wide range of temperatures. This elevated level of durability results in tablets that deliver reliability in almost any environment, assuring maximum mobile worker productivity. The Toughpad A1 offers optional 4G (LTE or WiMAX) mobile broadband as well as Bluetooth® v2.1 + EDR, 802.11a/b/g/n Wi-Fi and satellite GPS. 10.5 x 8.3 x 0.67 in. The Toughpad™ A1 will be available in the Spring of 2012 starting at $1299. The Toughpad B1 will be released later in 2012, with more details coming closer to availability. Both devices can be purchased through authorized Panasonic resellers. Sales inquiries for Panasonic’s Toughpad family of Android-powered tablets should be directed to sales.psc@us.panasonic.com or 877-803-8492. The Toughpad family comes standard with the industry’s most comprehensive 3-year warranty. Panasonic will offer a full set of professional-grade accessories to support the Toughpad line, including cases, mounts, printers, keyboards, magnetic stripe readers, Smart Card Readers and multi-unit storage and charging solutions. Images of the Toughpad can be found on the brand’s Flickr page; various Toughpad videos can be found on the brand’s YouTube page and an article discussing enterprise tablet computer deployment considerations can be found on the brand’s blog – Toughbloggers.com. Panasonic Solutions Company empowers people whose jobs depend on reliable technology. The company delivers collaboration, information-sharing and decision-support solutions for customers in government, healthcare, education and a wide variety of commercial enterprises. Products and services within the company’s portfolio include Panasonic Toughbook and Toughpad mobile computing solutions, projectors, professional displays (including both plasma and LCD), and HD and 3D video acquisition and production solutions. As a result of its commitment to R&D, manufacturing and quality control, Panasonic is known for the reliability and longevity of its products. Panasonic Solutions Company is a Division of Panasonic Corporation of North America, which is the principal North American subsidiary of Panasonic Corporation (NYSE: PC).